Hello, and apologies for the radio silence! I’ve been crazy busy, and adjusting has taken a little while – but I’m back now! (Of course, it does’t help that my computer is being particularly touchy lately.) Being the over-eager shopper that I am, I actually did the majority of my fall shopping before fall even started. I’ll probably need to pick up some more heavy sweaters as the weather gets cooler, but I was able to stock up on some essentials (on sale!) that I’ve already gotten a good bit of wear from, and that I know will take me through the season. 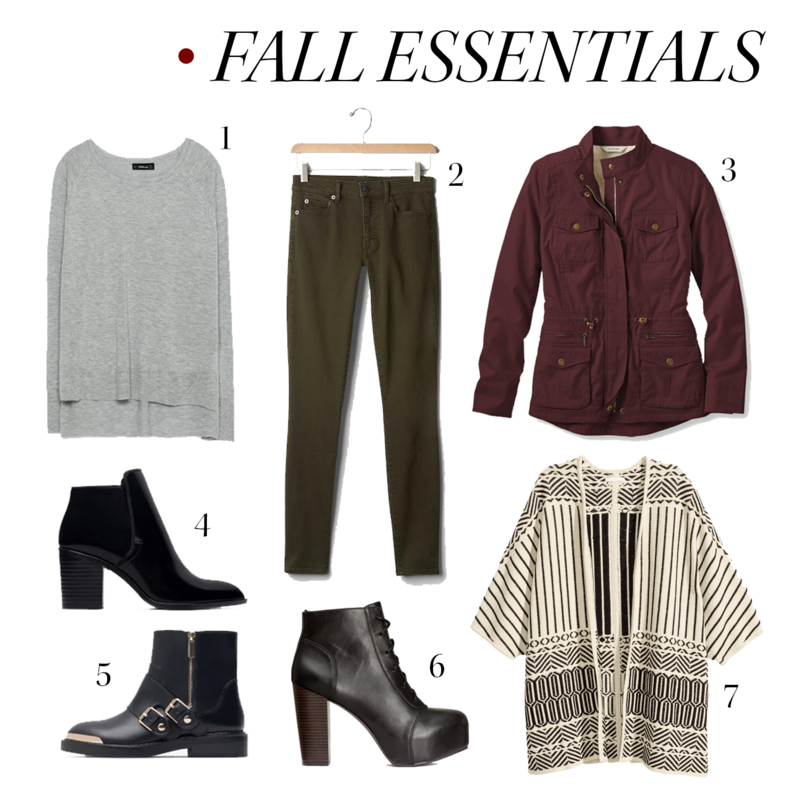 Here are some of my must-have fall pieces, along with a few items I’m still coveting. 1 // Last year, I found myself over and over bemoaning the fact that I didn’t have an easy, slightly slouchy gray sweater to throw on when I was up early and craving a comfortable, low maintenance – but still effortlessly cool – outfit. So finding the perfect one was my top priority this season – and of course, I found it at Zara. It comes in a bunch of great fall colors (I’m thinking I should grab another one), and it’s the perfect layering sweater: thin, but still more substantial than a t-shirt. 3 // I struggle to find coats that are both stylish and functional – I’ve ended up with marshmallow-esque parkas (which have their place) to pea coats that are basically decorative. This one checks off both boxes – it comes in a gorgeous deep purple-burgundy, but has plenty of pockets and an extra-warm furry lining. And the name, field jacket, just sounds so classic. 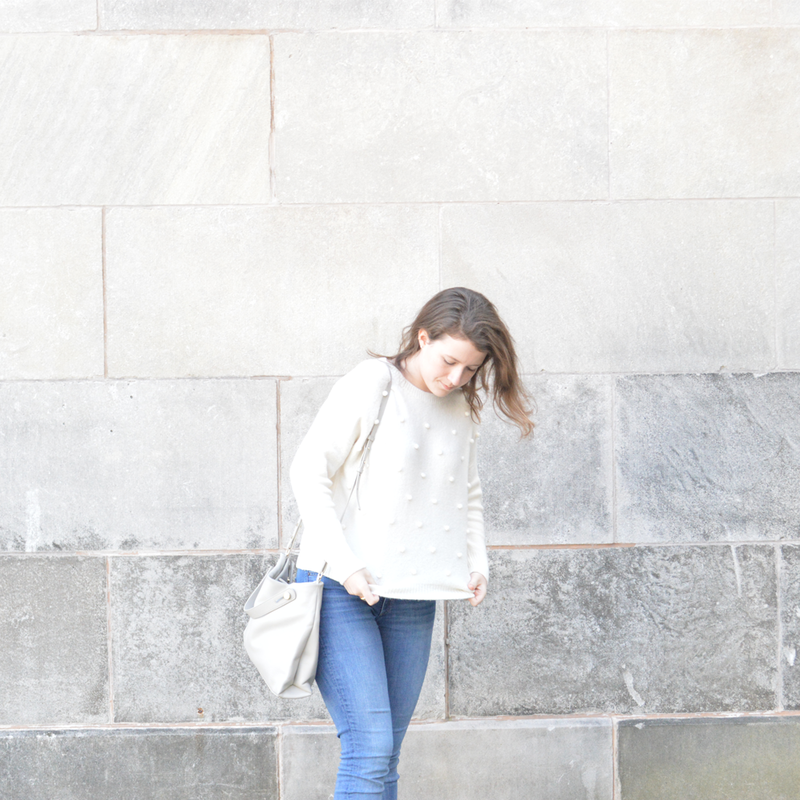 4 // I haven’t yet added a short, streamlined bootie to my wardrobe, but that needs to change. The bootie strikes the perfect balance between a combat boot and classic riding boot – it’s short, modern, but still distinctly casual. This patent pair from Zara is cool and sleek, and doesn’t veer towards the edgy or rustic vibe that tends to come with most casual boots. 5 // Another bootie option I love: an updated take on the combat boot. This pair from Zara is less dressy than the aforementioned boots, but they’re still more polished than the average lace-up pair. Their flat heel and streamlined profile keeps them casual, but metallic hardware ups the chic element. 6 // So I actually bought these boots a year or two ago (in a slightly different color/textile), but I’ve only started wearing them with regularity recently. They make any outfit a little edgier, and they’re a step up from basic flats. Despite their height, they’re pretty comfortable – I can wear them for a full day without pain (or becoming exhausted). Another plus: they’re budget-friendly! 7 // During the Zara sale this summer, I found what might be the most perfect cardigan (see this post for evidence) – I haven’t worn it too much yet, but it’s seriously cozy. I found a pretty similar style on H&M because everyone needs a giant, black and white cocoon sweater. You can throw it over a maxi dress, pair it with a mini skirt and simple tee, wear it with jeans and a thin sweater (see #1)…basically, it goes with everything, looks effortlessly chic, and feels like a blanket. You’re welcome.